Lightning strikes are a serious concern for school officials who are responsible for protecting the safety of everyone who uses their facilities. To protect athletes and spectators, school officials may instruct athletic trainers to use NOAA’s observational method of estimating the distance from lightning activity. For example, if thunder sounds within 30 seconds of a lightning flash, trainers typically delay a game or practice for 30 minutes. This 30/30 rule or flash/bang method, however, doesn’t always provide sufficient warning to evacuate the playing field and bleachers, preventing injury. Officials at three high schools in Cache Valley, Utah (Logan, Sky View, and Mountain Crest) wanted a better system that would warn them of the chance of lightning before lightning is seen or thunder is heard. Campbell Scientific worked with school officials and athletic trainers to determine which meteorological parameters to measure, and then we configured lightning warning systems specific to each school’s needs. At the heart of each school’s system is a CS110 Electric Field Meter that indicates the potential for lightning strikes in an approximate five-to-seven-mile radius, providing enough time to seek shelter when necessary. In addition, each system measures air temperature and relative humidity. Mountain Crest’s system also measures wind speed and direction, solar radiation, and rainfall. To protect the equipment from vandalism, all of the lightning warning systems were installed on the roofs of the schools. At each high school, the RA100 strobe lights were positioned to be visible from the playing field and bleachers. A flashing blue light indicates that there is no threat of danger. The yellow light flashes to signal a state of caution. A flashing red light, accompanied by a siren blasting a three-second alarm every two minutes, warns that there is enough electric charge in the atmosphere to trigger a lightning strike. School officials can monitor either the strobes and siren or the web page, assess the danger in the immediate area, and stop or delay athletic events—before lightning strikes. School officials can declare an evacuation of the area and instruct people to seek shelter. After the electric-field data indicates that the danger of a lightning strike has passed, outdoor activities can be resumed. 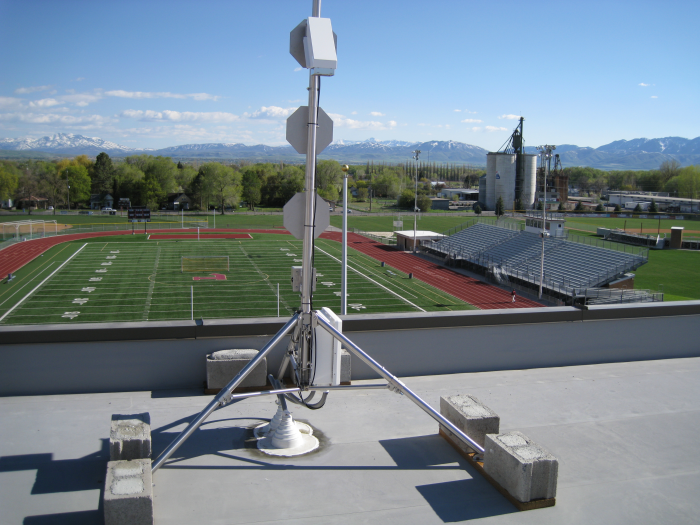 In 2008, Logan High School became the first school in Utah to use an electric-field meter to detect approaching lightning storms. Sky View followed in Logan High’s footsteps in 2010. The electric-field meter at Mountain Crest was installed in 2011. Cache Valley school officials appreciate having data to help them assess lightning risk and make safety decisions. In August of 2010, school officials at Logan High reviewed the electric field meter data and decided to delay an evening football game. That same night, at a high school football game approximately 130 miles away, a girl was injured by a lightning strike before the area had been evacuated.